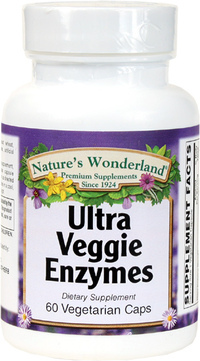 Ultra Veggie Enzymes, 60 Vegetarian Capsules (Nature's Wonderland) - Penn Herb Co. Ltd.
Ultra Veggie Enzymes contain a broad array of key plant enzymes to help break down many types of proteins, carbohydrates, fats and fibers. It also includes Cerecelase®, which supports digestion of fibrous foods such as grains, fruits and vegetables (beneficial for vegetarians and others who consume diets high in fruits & vegetables). Lactase...digests lactose (the naturally occurring sugar in milk). Get the most out of your foods for optimal health & vitality! Comprehensive plant enzyme formula supports complete digestion of many types of proteins, carbohydrates, sugars, starches, fats, dairy; hard-to-digest foods and fibrous foods such as grains, legumes, fruits. As a dietary supplement, adults take 1 vegetarian capsule immediately prior to mealtime, or as directed by a health care professional.